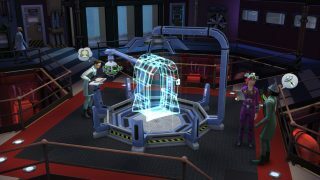 The Misadventures of a Lovestruck Scientist in The Sims 4 Get to Work Expansion Pack*. Last week we stepped into a crime scene and joined detective Tate Rackett as he cracked another tough case. 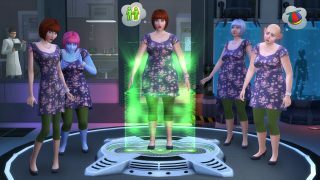 This week we’re looking into the lives of two scientists in The Sims 4 Get to Work. Each day, Darla Nadine Applesworth arrives at the science lab at 7:00 a.m. She loves her job, but she loves something else even more: her co-worker and fellow scientist, Herbert Leipstein. Herbert likes Darla, but truly only thinks of her as a friend and colleague. She wishes it was different. Maybe one day, it will be. Darla likes to get a jump start on the day, working on new inventions by herself before anyone else gets in. Her hard work has paid off – she invented the Momentum Conserver and a Hover Lamp, both of which she took home to display as decorations. 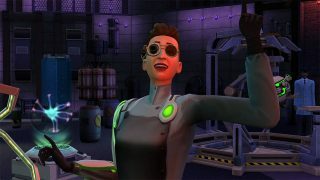 One morning, Darla was experimenting and using the Chemical Analyzer when she had a breakthrough. She ran over to the Invention Constructor and began tinkering. Tah-dah! The Cloning Machine was created! Herbert arrived a few minutes later, looking as handsome as ever in his lab coat. Darla was thrilled to show Herbert her latest invention. He steps into the machine with a huge grin on his face. Darla begins scanning and BOOM! A clone of Herbert steps out. The new Herbert looks exactly the same as Herbert. It was Darla’s lucky day – two Herberts! They named the clone Number One. Number One was almost exactly the same as the original Herbert except for one key difference: he didn’t have any relationships or knowledge of this world. He was a clean slate. Darla and Herbert introduced themselves to Number One and had him wait in the lab next door, giving him some activities to do to keep him busy. Darla and Herbert wasted no time. They made another clone. And another. The final clone, Number Five, was a little different. He had red eyes and a goatee. Something was… off. Oh well. Time to leave work! Darla walked into the lab next door and told the clones they were coming home with her. She couldn’t leave them at the lab overnight, they could get into real trouble. Plus, Darla liked the idea of having five replicas of Herbert hanging out at her house all night. Back at her home, they decided to have a party. It was everything Darla had hoped for… until Number Five started yelling and making a mess all over Darla’s house. This wasn’t right! This wasn’t what she expected at all. We hope you have enjoyed this peek at the Scientist career and a bit of a love story. In our next adventure, we’ll follow the path of a Retail Business Owner and see the ups and downs along the way to the top.